The Financial Supervision Commission has approved a minimum yield of -1.23 % on an annual basis, resulting from the management of the Universal Pension Funds /UPF/’ assets for the preceding 24-month period, considered from 30 June 2014 till 30 June 2016, while for the same period of time the minimum yield for the Professional Pension Funds /PPF/ has been determined at - 0.92 % on an annual basis. The weighted average yield (modified weighted yield ) of UPF for the same period, calculated on an annual basis, is 1.77 % and for PPF 2.08 % respectively. The Financial Supervision Commission has approved a minimum yield of -0.77 % on an annual basis, resulting from the management of the Universal Pension Funds /UPF/’ assets for the preceding 24-month period, considered from 31 March 2014 till 31 March 2016, while for the same period of time the minimum yield for the Professional Pension Funds /PPF/ has been determined at -0.74 % on an annual basis. The weighted average yield (modified weighted yield ) of UPF for the same period, calculated on an annual basis, is 2.23 % and for PPF 2.26 % respectively. - Is Europe getting the most from its pension system? - What are the barriers to pension investment across the EU economy? - How can we extend retirement saving to those with no access at the moment? - What is the latest on pension design? These will be some of the issues on the agenda as Europe’s top pensions decision-makers meet to discuss the latest developments in retirement saving and investment at the second PensionsEurope Conference. Join them and take your place at the heart of Europe’s pensions debate. 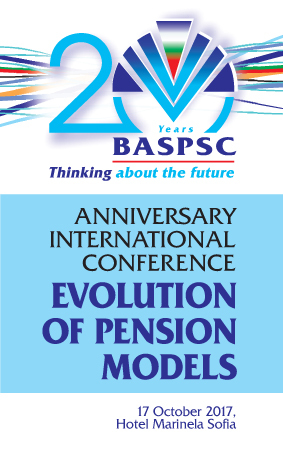 The event is expected to attract between 150-200 people and is aimed at anyone involved in pensions across Europe - from pension managers and trustees to HR specialists, finance directors, consultants and advisers. The Financial Supervision Commission has approved a minimum yield of 0.78 % on an annual basis, resulting from the management of the Universal Pension Funds /UPF/’ assets for the preceding 24-month period, considered from 30 December 2013 till 30 December 2015, while for the same period of time the minimum yield for the Professional Pension Funds /PPF/ has been determined also at 0.78 % on an annual basis. The weighted average yield (modified weighted yield ) of UPF and PPF for the same period, calculated on an annual basis, is 3.78 %. Plans to restrict the ability to switch between the funded system and the first pillar have been dropped, Barbara Ottawa finds. The Financial Supervision Commission has approved a minimum yield of 0.25 % on an annual basis, resulting from the management of the Universal Pension Funds /UPF/’ assets for the preceding 24-month period, considered from 30 September 2013 till 30 September 2015, while for the same period of time the minimum yield for the Professional Pension Funds /PPF/ has been determined at 0.51 % on an annual basis. The weighted average yield (modified weighted yield ) of UPF for the same period, calculated on an annual basis, is 3.25 % and for PPF 3.51 % respectively. The Financial Supervision Commission has approved a minimum yield of 2 % on an annual basis, resulting from the management of the Universal Pension Funds /UPF/’ assets for the preceding 24-month period, considered from 28 June 2013 till 30 June 2015, while for the same period of time the minimum yield for the Professional Pension Funds /PPF/ has been determined at 2,10 % on an annual basis. The weighted average yield (modified weighted yield ) of UPF for the same period, calculated on an annual basis, is 5 % and for PPF 5,10 % respectively. The Financial Supervision Commission has approved a minimum yield of 3.72 % on an annual basis, resulting from the management of the Universal Pension Funds /UPF/’ assets for the preceding 24-month period, considered from 29 March 2013 till 31 March 2015, while for the same period of time the minimum yield for the Professional Pension Funds /PPF/ has been determined at 3.51 % on an annual basis. The weighted average yield (modified weighted yield ) of UPF for the same period, calculated on an annual basis, is 6.72 % and for PPF 6.51 % respectively. There are worrying developments for supplementary pensions taking place in Bulgaria. In order to improve public finances, the Bulgarian Government has decided to enable employees to transfer their pension funds’ assets into the public pay-as-you-go pension system, which jeopardizes the existing multi-pillar pension system.